At 0531 on May 14, 1945, Ensign Nobuaki Fujita took off from Kanoya Air Base as pilot in a Zero fighter carrying a 500-kg bomb and died in a special (suicide) attack east of Tanegashima at the age of 23. He was a member of the Kamikaze Special Attack Corps 6th Tsukuba Squadron. After his death in a special attack, he received a promotion to Lieutenant. He was from Tokushima Prefecture, attended Tōkyō University of Agriculture, and was a member of the 14th Class of the Navy's Flight Reserve Students (Hikō Yobi Gakusei). 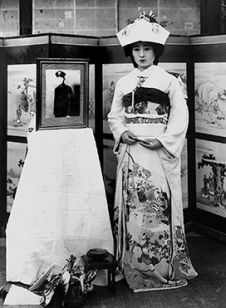 Fujita desired to get married to a woman named Mutsue from Tōkyō, but her parents were against it since it was clear that she would soon become a widow. However, Mutsue wanted the marriage and protested to her parents, so finally they permitted it. Fujita found out about her parents' change of mind on May 11, 1945, and three days later he died in a special attack. 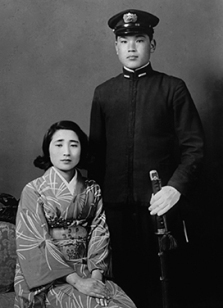 After his death in battle, a wedding ceremony was held at the house of Fujita's parents in Tokushima Prefecture. After the war's end, she returned to Tōkyō with the consent of her adoptive father. She attended a university and remained single until her death in 1993. Today on May 11, I was scheduled to transfer to Kanoya Air Base in Kagoshima, but it was delayed until May 12 due to poor weather. When we separated and returned to the officer barracks, I was told of a letter from you. In the midst of the grave reality of the war situation, besides the joy of discovering my "self," I keenly feel that I in particular am the most fortunate child in the entire country. In the three months since I have been with Tsukuba Air Group, we have shared joys and sorrows. The facial expressions of cherry blossoms in the same class  have become happier and happier. We naturally found meaning in happy moments with joy and innocence. Without discussing meaning, my mental state is such that things are especially fleeting like water. Since my kind wife Mutsue has humble virtue, please take good care of her. Father, Mother, thank you for taking care of me for a long time. Please make me your child forever and ever in both the next world and the coming world. Well then, farewell. I will go in high spirits. I pray for prosperity for the Fujita Family and happiness for everyone. My dear beloved wife Mutsue! Both in the coming world and the next world, and also in the world after that, please be my wife. Mutsue, Mutsue, Mutsue. More than anyone I love you with your gentleness. Mutsue, farewell. Mutsue, Mutsue, Mutsue, Mutsue! Kind, kind single Mutsue, farewell! Another day. The letter to his parents comes from Hakuō Izokukai (1952, 193-4). The letter to his wife and the photos below come from an exhibit at Tsukuba Naval Air Group Museum. The biographical information in the first paragraph comes from Hakuō Izokukai (1952, 193) and Osuo (2005, 199). The information in the second paragraph comes from the following web page about the Kamikaze Special Attack Corps, <http://ohmura-study.net/340.html> (May 25, 2018), which obtained information about Fujita's wife from Tsukuba Naval Air Group Museum. 1. The phrase "cherry blossoms in the same class" refers to Fujita's comrades. 2. A Japanese Navy kutai was a group of four aircraft. Hakuō Izokukai (Hakuō Bereaved Families Association), ed. 1952. 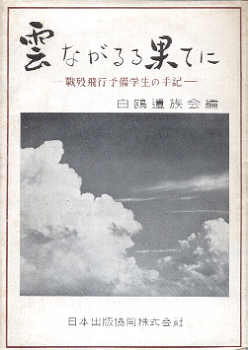 Kumo nagaruru hate ni: Senbotsu kaigun hikō yobi gakusei no shuki (To the end of the flowing clouds: Writings of Navy reserve student who died in war). Tōkyō: Nihon Shuppan Kyōdō.